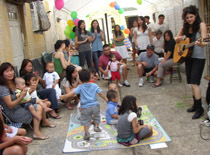 2nd birthday parties for toddlers in NY, NJ and Conn.
Are you planning your toddler’s second birthday party? around under a parachute to a live guitar and fun songs. that two year old toddlers will have a blast!